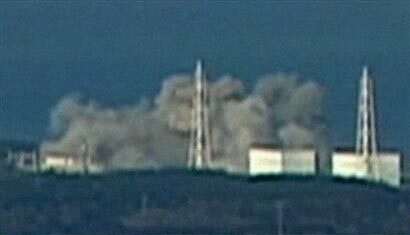 A hydrogen explosion occurred this morning at the quake-hit Fukushima No. 1 nuclear power plant’s troubled No. 3 reactor, the Japanese government’s nuclear safety agency said. The 11:01 a.m. incident came after a hydrogen explosion hit the No. 1 reactor at the same plant Saturday, and prompted the Nuclear and Industrial Safety Agency to urge residents within a 20-kilometer radius to take shelter inside buildings. It also followed a report by Tokyo Electric Power Co., the plant’s operator, to the government earlier in the day that the radiation level at the plant had again exceeded the legal limit and pressure in the container of the No. 3 reactor had increased. The Fukushima No. 1 nuclear plant has been shut down since a magnitude 9.0 quake struck northeastern and eastern Japan on Friday, but some of its reactors have lost their cooling functions, leading to brief rises in the radiation level over the weekend. Meanwhile some 2,000 bodies were found today on two shores in Miyagi Prefecture. The findings will significantly increase the death toll from the quake and ensuing tsunami, with police having so far confirmed 1,597 deaths and 1,481 people missing across the affected areas in northeastern and eastern Japan.